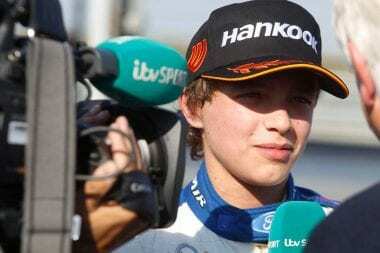 Take a look at the Lando Norris profile here. The 15 year old racing driver recently claimed the 2015 MSA Formula Championship. It was the debut season for the series. BRANDS HATCH 11 OCTOBER, 2015 – A worthy champion with a bright future ahead of him in motor sport – that’s 15-year-old Lando Norris, who yesterday clinched the inaugural MSA Formula crown, and with it the coveted title FIA Formula 4 Champion of Great Britain. Eight race wins and six second-place finishes at the wheel of his Ford EcoBoost-powered and Carlin-prepared car gave Lando the points he needed to claim the title with a race in hand, but the statistics are only part of the story. His cool, calm and collected demeanour at the wheel and impressive ability in testing and qualifying are the key elements to his success in the toughest junior single-seater series in the UK. Somerset-based Norris was just four months past his 15th birthday when he claimed victory in the first MSA Formula race at Brands Hatch in April but he came to the championship with multiple karting titles to his name and useful race-winning experience in cars gained during the 2014 Ginetta Junior sports car series. Despite this, he says, he took time to settle into the new world of single-seaters: “It was quite a big jump for me, quite different to what I was used to. It took a bit of time to settle in and the team were a great help. “Carlin have done a great job for me all year, right from the start. We’ve had fewer mechanical problems than the other teams and that’s basically because they’ve worked harder. In pre-season testing it was reliability that we really focused on – not making the car fast but making sure that we didn’t have any mechanical issues later on. After that we were able to really work on the speed of the car. Following his twin wins at Brands Hatch at the start of the year, victories followed at Thruxton, Oulton Park, Knockhill, Rockingham, Silverstone and the Brands GP circuit, assisted greatly by Lando’s stellar performances in qualifying. He was quickest in qualifying at five of the 10 meetings – no other driver managed it more than once – and he never qualified lower than second. His MSA Formula victory will certainly help Lando with his ambition, for in addition to the silverware he wins an F3 test with a top European team and also 10 valuable FIA F1 Superlicence points.